This opens up the rights for a variety of uses that were previously restricted, including Theme Parks. Amazon has recently announced a new deal to create a LOTR streaming series based on this new availability. "I recognize Walt Disney's talent, but it has always seemed to me hopelessly corrupted. Though in most of the 'pictures' proceeding from his studios there are admirable or charming passages, the effect of all of them to me is disgusting. Some have given me nausea"
What do you think? Does this open up the possibility of a deal for a themed land? Does his distaste for Disney mean the rights will be more likely to land elsewhere? Universal does need IP for those 3rd and 4th (oops! those 4th and 5th parks) on the Lockheed-Martin property in Orlando. I wonder if there's any cash left in the coffers after all the expansion over the last several years? Let's see. 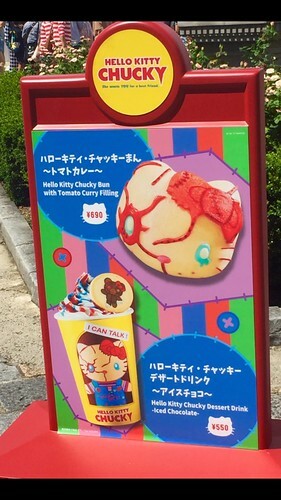 I could go for a park themed to the classic Universal monsters, Middle Earth, Nintendo, Fantastic Beasts, and, oh yeah, Hello Kitty (especially that Chucky Hello Kitty that Douglas talked about in his USJ trip report). I could definitely see Universal picking this up for the new property over by Lockheed-Martin, Tim. I'm sure Comcast/NBC has plenty of money left lying around, if they are willing to spend it. That seems to be no problem for them lately -- they are investing heavily in their theme parks. I like your ideas for themed lands. An actual "Jurassic World" land would be great and they could keep the classic Jurassic Park over in IOA for nostalgia. This is starting to look like a pretty great theoretical park. Hello Kitty Chucky deserves at least her own theme park, if you ask me, although I'm leaning towards giving her an entire resort! Zombie Kitty looks like much more fun than regular Kitty. As a diehard Tolkien and LotR fan, who shares many of Tolkien's religious, aesthetic, artistic, and cultural concerns, this new deal concerns me greatly. I can get past the new Shadow of Mordor/War games, if only on a gameplay level, but if they are any indication of whats to come, I will be bitterly disappointed to the point of genuine anger and rage. Amazon will try and push agendas that are anathema to the core vision of Tolkien and divert so far away from what Tolkien's intentions that it will be hard to watch. Here's to hoping that by some miracle I am wrong. As for theme park opportunities, that has me a bit more excited. I agree, Blake. I hope that anything that is done with this material is up to hight standards of the material. I'm also excited about theme park opportunities. I know Universal would do an amazing job with a LOTR park. What would you guys like to see in a theoretical LOTR park? As I have posted previously, Christopher Tolkien and the estate have been the hang up, and there have been family members open to more liberal rights usages. That has now changed. With the negotiations to Amazon and the recent settlement, all things are now possible. I will point out that Peter Jackson does have a relationship with Universal and the theme parks, and while the Kong was not completed at my last Orlando trip, I really like it at Hollywood. If that is what is being planned down the road in Orlando, I am not sure I could contain myself. There isn't enough technology now a days to do a decent LOTR theme park. ...and if they were really clever they'd go after something a little off the beaten path like getting ahead of the Matrix reboot they are currently working on. I, as much as anyone else, would LOVE to see Middle Earth become a theme park reality, but if it's juxtaposed in a theme park next to Harry Potter, I think both franchises would be diminished. I was under the impression that the Tolkien Family Trust won the lawsuit, and Universal had nothing to do with it, but I could be wrong. Christopher Tolkien was vehemently opposed to further expansion of the rights, and he recently stepped aside in his involvement with the trust to allow the Amazon deal to go through. His stepping aside would allow theme park owners to negotiate the rights, which he would have opposed. I also agree that Middle-Earth next to Potter would be a problem for both, so if Universal got it, and planned for Orlando, it would need to be down the road. Professor Tolkien was very anti-Disney, and that has been pointed out in articles and interviews in the past, and was how Ralph Bakshi ultimately got the film rights, which is actually somewhat more faithful in some respects than the Peter Jackson films, but not all. It was a flop, and only half finished. I agree that this would not fit in next to HP. However, it would make an amazing anchor for a new park! If Universal is planning a new gate, and I think they are, it will be amazing to see what they design -- whatever the IP they select.